Happy Bloggers Challenge Friday, thanks to everyone who played along with last weeks sketch challenge, it's always fun to see how everyone interprets a sketch! This weeks challenge is to use the colors Peach, Green and White (or Vanilla), feel free to add neutrals as needed. When I listed this weeks color challenge on the yahoo group for the team, I had in mind Spring Flowers, when talking to Kim the other day she said the colors reminded her of a baby card. It will be fun to see how everyone uses the colors. I did opt to go the flower route, and created a sympathy card for a dear friend of mine who just lost her father, I hope it brings her some comfort. I just love this sentiment from Stampotique. For more inspiration, the Bloggers Challenge Players will be linking in below, be sure to stop by and visit them. If you'd like to play along with this weeks Bloggers Challenge, please link back to this post on your blog and mention you created your card for the Bloggers Challenge Color Challenge and add your link using the Link Tool below. Just a note on the link tool, your link should be a direct link to your Bloggers Challenge Post, use your name as the Title. Please do not link to cards that were created prior to the challenge. Entries not linking properly will be removed. Everything is so beautiful on this card Lisa, I don't know where to begin. I love the roses, the tones are stunning. The pearl swirls are so elegant and the background papers are uniquely beautiful. Gorgeous! It is beautiful to look at and the sentiment is perfect for the occasion, great card. Gorgeous stitching and details with the flowers! I agree with Gayle!!! Gorgeous card, Lisa. I'm sure J will appreciate receiving this beautiful card...I love that sentiment, too! Wow- such a wonderful card with the color challenge- I love the sentiment and the beautiful flowers- and such a thoughtful card too! Beautiful. Everything about your card is awesome. The sentiment is perfect. I know your friend will feel the love. great choice of the papers and the pearls are gorgeous! Such a beautiful and thoughtful card. I am sure your friend will appreciate your caring! Have a great Friday! Your flowers are so beautiful. I had so much fun with these colors. So many ways to use them. Wow this is just so pretty and elegant. I know the recipient will appreciate your kindness and thoughtfulness when she receives this lovely card. Soft, subtle and so pleasing to the eye. I entered a digital piece based on an arrangement I made and photographed. If you do not allow digital please let me know. I like to enhance my paper collage work in this manner. Hope it's ok. Feel free to remove if it is not what challenge allows. I just love color! 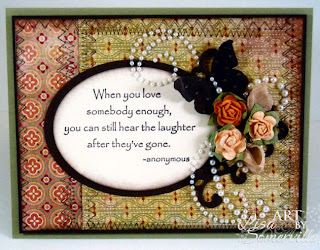 Stunning card and is perfrct for a sympathy card. What a beautiful Sympathy card. Your embellishments are gorgeous. Such a lovely card....so elegant. I'm not sure I've ever seen pastel colors look so sophisticated! Beautiful card! I love how the black really pulls out the colors and makes them pop. This is one stunning card -- the sentiment is a favorite of mine. I think this card would be treasured by whomever received it.